Children often prefer unconventional play areas because it is easier for them to imagine they are playing in unsanctioned or unofficial space - which, as we all know, can be a thrill for them. A play area that goes beyond the standard monkey bars or coloured balls can leave a lasting impression on a delighted child’s memory. 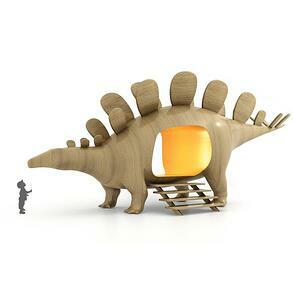 This minimally designed stegosaurus is a sleek and excellently scaled climber that is brilliantly unique when compared to any other play area. For a small child, this 9 metre long climbing apparatus looms like a real, life-size dinosaur. Its smooth, lacquered outside is aesthetically pleasing, safe and splinter free, and has a rich neutral colour that can work with any décor. Children can walk with the dinosaurs with this excellent artistic play piece. Kids can go on great undersea adventures with this rainbow marine guardian made of high pressure laminate. This play piece is extremely durable, dirt resistant, scratch resistant, and can thrive both in outdoor or indoor locations. 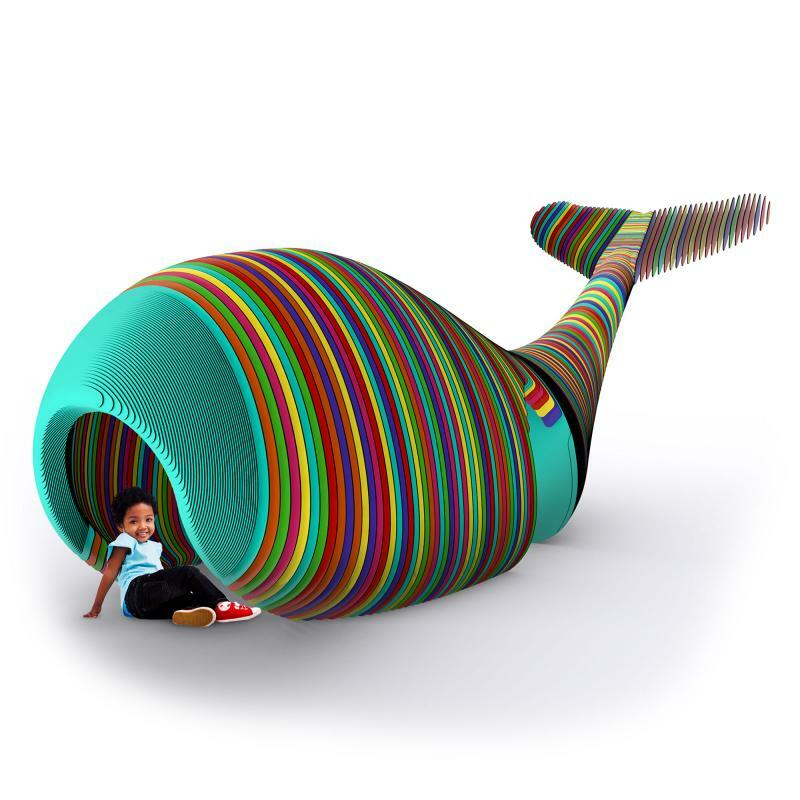 The space in the belly of this 16 foot whale is rounded and cozy, but opens enough to provide light and allow parents to keep a line of sight on their children whenever they need to. Kids can brave the deep with this colourful marine mammal friend. 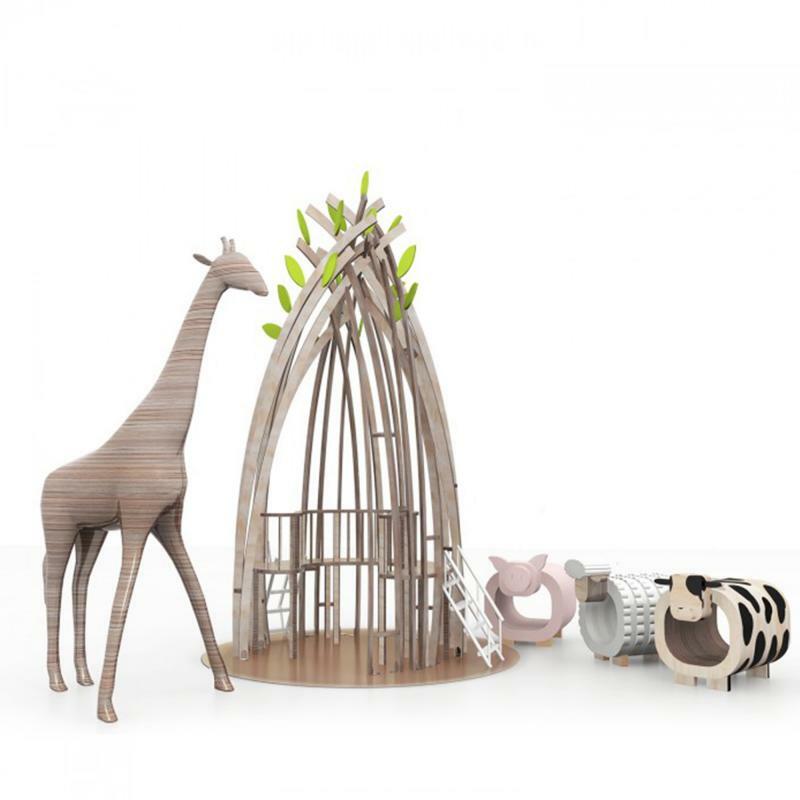 With our treehouse design, children can live among the trees in a game of make believe right out of a classic story like the Jungle Book. This sturdy circular structure works for kids of all sizes and can accommodate any adventure they want to go on. The treehouse is six metres tall and is made from strong hardwood with a bright, natural finish along the outside. It creates the illusion of being impossibly tall while at the same time being totally safe for any adventurous child wanting to explore jungle trees. Make the extra effort to have families with children of all ages be comfortable in your space. The right play structure can make a child’s whole day - and by extension, make their parents’ day as well. A happy and stimulated child is often a well-behaved child. Having play structures around your lobby, waiting area or foyer can make all the difference.